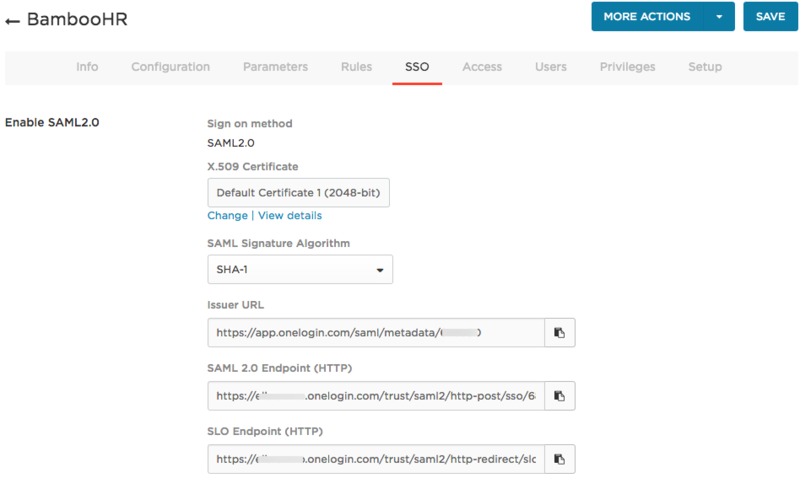 This topic describes how to configure OneLogin to provide SSO for a SAML-enabled app. The instructions provided here are generalized to apply to any SAML-enabled app, with notes highlighting configurations that may differ between apps. We also provide hundreds of app-specific instructions in the App Integration section of the help center. Search for the app you want to configure and select it. Go to the Configuration tab and enter the Application Details that help OneLogin know where and how to send the SAML message. Note. Some apps don't have a Configuration tab; go straight to step 6. Many apps require that you enter the URL used to access the app. Others require just the subdomain (mycompany in https://mycompany.coolapp.com). Others may require your company, group, or organization name. The Configuration tab usually tells you what you need to enter. See also the app-specific documentation in App Integration. Note. Some apps allow provisioning: creating and updating user accounts in the app, based on OneLogin user attributes. Provisioning-enabled apps often require that you authenticate to an API to provide a secure connection between OneLogin and your app. These apps display an API Connection section on the Configuration tab, which you can ignore unless you want to configure provisioning. See Introduction to User Provisioning. In most cases, you can also accept the default attribute mappings. SAML assertions must pass a user identifier at a minimum, which is usually either NameID or Username. These are almost always set to OneLogin Email. In other words, OneLogin sends the user's OneLogin email address as the NameID or Username in the SAML assertion, and for SAML SSO to work, the OneLogin email address must be identical to the username or primary email address associated with the user account in the app. 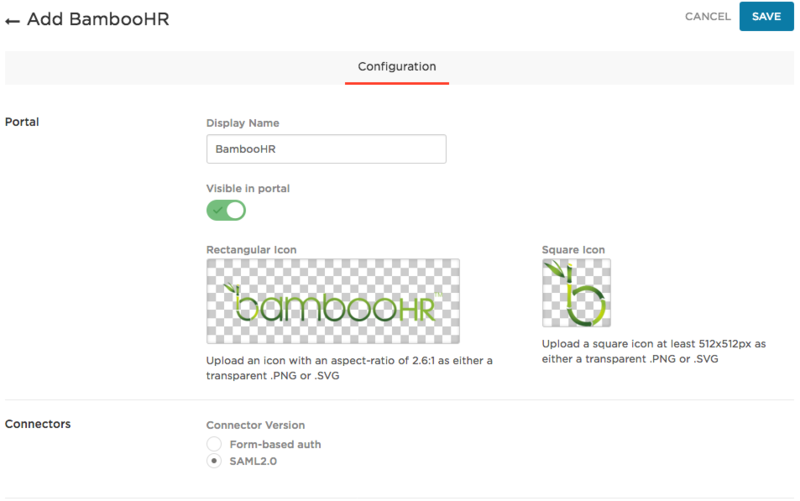 For details about other listed attributes that are passed as SAML parameters, see the app-specific documentation in App Integration, if available. If for any reason you need to change the OneLogin value that is mapped to an app attribute, click the parameter row to open the Edit Field <Fieldname> dialog. Go to the SSO tab to copy the SAML metadata that you must provide to the app provider to complete the integration. Some app providers ask for the SHA fingerprint instead of the certificate. You can also get that by going to View Details. Sometimes an app provider will accept a single XML metadata file containing all of the SAML metadata required for setup. You can get it by going to the More Actions menu and clicking SAML Metadata. Provide the SAML metadata to the app provider. Typically, this means that you log in to the app as an administrator, navigate to the SSO or SAML setup interface, enable SSO, and paste the SAML metadata into the interface. Some app providers, however, require that you contact support and provide them with the metadata. For more information, see the app-specific documentation in App Integration if available, or your app's administrator documentation. In OneLogin, go to the Access tab to assign the OneLogin roles that should have access to the app and provide any app security policy that you want to apply to the app. Ensure that you have matching user accounts in the app and OneLogin (the OneLogin email address or username is identical to the app username). You can create a test user, or you can use your own account.